The following terms and conditions represent the basis upon which driving lessons and courses are offered to you. All XT instructors are members of one of the three main trade bodies, the ADINJC, the DIA or the MSA and are signed up to the DVSA Code of Practice. Tuition fees are payable in advance. All accounts must be cleared before taking the official practical driving test. All Lessons purchased either via a voucher or block booking must be taken within 6 months of the date of purchase. A lesson record sheet should be issued either before or on the first lesson. Clients are advised to carry the sheet so that at the end of a lesson the next appointment/s can be entered. Clients MUST personally ensure that they are the holders of a valid, current driving licence – which must be produced at the first lesson, and will be regularly checked by their driving instructor. The picture on photo card licences expire after ten years, your photo card licence must be up to date. Clients MUST inform their driving instructor if they receive any endorsements on their licence during the time they are receiving tuition. Including any short period disqualifications (SPD). Clients MUST inform their driving instructor of any special needs or medical conditions they have that might affect their ability to drive. In the interest of comfort and safety, clients are advised to wear suitable footwear and comfortable clothing which does not restrict movement, please ask your instructor for any advice you may require. If by reason of a vehicle failure or other emergency a lesson has to be postponed at short notice, an alternative appointment will be made with mutual consent. If the postponement is a driving test, the school/instructor will be responsible for the test fee if it cannot be cancelled within the required time, regardless of the client’s continuation of lessons with the school/instructor. Clients will appreciate that it may not always be possible to notify cancellation if a breakdown occurs on the way to a lesson. a) At least 48 hours’ notice of postponement or cancellation of a lesson is required. Please note that Sundays and public holidays are not counted as working days. Late cancellations will be charged for at normal lesson rate. c) THE SCHOOL/INSTRUCTOR CANNOT BE HELD RESPONSIBLE FOR ANY POSTPONEMENT OR CANCELLATION OF A TEST BY THE TESTING AUTHORITY – AT WHATEVER NOTICE. c) Clients may be accompanied on their lesson by senior examiner, whose job is to ensure that the tuition given meets the required standard. This is a legal requirement and is in the public interest. d) If an authorised trainee instructor is used, a client may expect a senior instructor present during some of the lessons. a) Your instructor will advise the appropriate time to make an application for both the theory and practical driving tests. The advice will be based on the client’s progress to date. It does NOT imply that the necessary standard has been reached, or that it will for certain be reached by the appointed test date, the school/instructor will not hesitate to advise, where necessary, the postponement of the test. This condition is intended to save the client expense, unnecessary failure, and the consequent delay in waiting for another test and obtaining a full license. are observed by examiners. This is a legal requirement and is in the public interest. d) Mobile telephones should be switched off during lessons to avoid unnecessary distraction unless by prior arrangement. e) No Passengers will be carried in the vehicle during Driving Lessons. f) You are reminded that when you attend for your theory or practical test, you MUST take the required documents with you; your instructor will advise you. Failure to comply with this regulation may result in your test being canceled; you will forfeit your test fee and have to apply for a new test date and pay the fee again. g) In the event of the test appointment being sent to the client, they are required to notify the school/instructor as soon as possible, of the date and time of the test and show the confirmation to their instructor on their next lesson. The school/instructor cannot accept any responsibility for booking an incorrect time or date for a test unless the appointment confirmation is produced. If the appointment is sent to the school/instructor, then an undertaking is given, to show the client the confirmation on their next lesson or notify them as soon as possible. Clients should not book a test date without prior approval from the Instructor. If a test is booked without prior approval or consultation from an instructor no guarantee can be made regarding availability of a vehicle for the test. i) Clients should notify the instructor/school immediately if the testing authority contacts them to alter the date or time of a practical test, if the client fails to do this, the instructor/school shall have no liability for any fees lost. 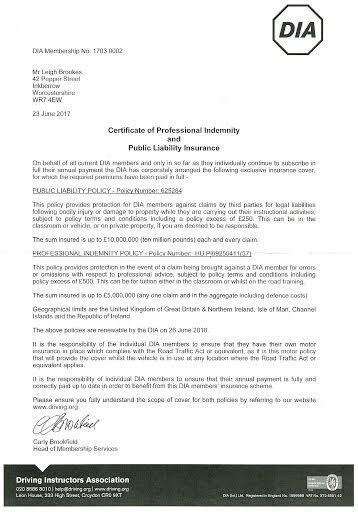 i) The car is fully insured for teaching for reward – and this must be confirmed, in writing, by the vehicle underwriters. ii) The instructor is covered by such insurance to drive the car – to be confirmed as above. iii) The instructor can in no way be held liable for any damage or accident. While the instructor will make every effort to prevent the client having an accident, or damaging the car, it will be realised that their control is very limited. If clients wish to have lessons in their own car, then a second rear view mirror must be provided for the instructor. In view of the extra responsibility entailed, there will normally be no reduction in lesson charges. a) Clients should be aware that their instructor’s primary objective is to promote road safety, and in doing so, he/she will have to issue instructions which clients must be prepared to carry out without undue argument. c) During an official driving test and / or lessons, the client is liable for any fines or charges levied as a result of any motoring offence committed. a) If you are unhappy with any aspect of your tuition you should notify the school/instructor without delay, and not later than seven days from the date on which the cause of the complaint arose. Every effort will be made by the school/instructor to satisfactorily deal with the complaint, these “Terms of Business” and the “Code of Practice for Approved Driving Instructors” forming the basis for negotiations.